Dune Road is titled Girl Friday in the U.K .
Last fall author Jane Green and I partnered up to nag each other to write and to celebrate progress, like two friends training for a marathon. Creative writing is tough. You sit alone with only your imagination for company. As a working mother, there are always competing claims on your time. Like Kit, the protagonist of Dune Road, Jane was recently divorced and juggling work with raising her children. What made Dune Road hard to write also made it good. Kit feels real. Here we have a single mother going through a rough transition and an ex-husband who isn’t letting go. Kit has to rework her friendships in a coupled community and reenter the dating scene in middle age. "As a writer Robert often puts his own life into his books, often without realizing it…." Anyone who followed Jane’s blog will have witnessed how life becomes material. For example, last Christmas Jane blogged about over-the-top decorations, which then appeared in Dune Road. Fictional Highfield, Connecticut sounds very similar to the posh suburb that Jane, an expat Brit, now calls home. Dune Road is not a memoir dressed up as fiction, but it is a novel that springs from life experience. This makes it ring true. Dune Road also feels real for its backdrop of current events. Usually a novel takes more than a year to write (I’m still working on mine) and then takes another 6-18 months to go from a completed manuscript to a published book. Jane writes at lightening speed, and her publisher, Penguin, has performed a miracle in getting this book out in June, only 3 months after it was completed. Dune Road may be the first novel set in the post stock market crash world. It is very much a book of our times where even the wealthy are not immune to reversals of fortune. "Never has a book been easier to write. It is as if he is writing on auto-pilot, the words flowing from his fingertips in a way they haven’t since –well, probably since his first novel. "Writing was so creative back then, but of late it has felt more and more like a business. He has contracts to fulfill, books to write: one book a year, whether inspiration strikes or not. "It has become a job, and one that he is starting to find dull. "The business of outlining, of researching, of sifting through to decide which bits are relevant and which bits are not, used to fill him with passion. "The moment when characters you thought were pivotal suddenly become irrelevant, when others, supposed to have been bit parts, end up driving the plot, taking over the book, filled him with pleasure." It filled me with pleasure to read a well-crafted novel that captured both the art of writing and the challenges of balancing career and family. You won’t find beautiful blocks of prose in Dune Road. Jane employs the understated style of a former journalist in which simple writing facilitates the story telling. Jane's focus is on relationships: family, friends, lovers and colleagues. Her work is a fine example of commercial women's fiction with many strong female characters of all ages. Tracy, the yoga instructor with a murky past, was especially fun. Jane is at her best when employing character-driven narrative. She weaves together multiple plot lines seamlessly. Dune Road isn’t flawless. The Annabel plot line seemed unnecessary and took attention away from the mystery plot. I would have rather heard more about Robert McClore, the most intriguing character. We eavesdrop on his thoughts and memories, but Robert rarely says or does anything. The characters and their interwoven relationships worked better than the mystery itself. I also preferred the Nantucket Island setting of The Beach House, Jane’s last novel, to the moneyed suburbs of Dune Road, but that’s just me. Some women are scared of big cities or the wilderness. I’m suburbaphobic. I still enjoyed Dune Road very much and will happily grab another Jane Green novel when I head to the beach or board a plane. Reading her books is like traveling with a chatty girlfriend who knows how to make you laugh. 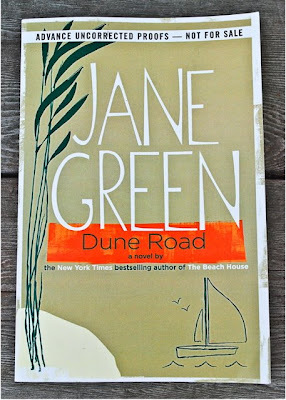 Dune Road is classic Jane Green with a touch of mystery. Jane's personal story has a happy ending. In March Jane finished her 11th novel and married Ian Warburg, creating a "Brady Bunch family" with her 4 children and his 2 children. Jane will still publish as Jane Green but has changed her name to Jane Green Warburg. Sarah Laurence: What is special about Dune Road/Girl Friday? How is it different from your other novels? SL: Do you have a Girl Friday? Does she assist you in a similar way as described in your novel? JGW: I do. I have my wonderful Sparkly Assistant, Elise. I could not live the life I do without her, because I am the most hopelessly disorganized person on the planet, mostly, I suspect, because I spend vast amounts of time inside my head. She does all the things Kit does, and so much more, besides. SL: What are your sources of inspiration? How do you start? JGW: I always have an idea of the theme, and then I spend time on the characters, because once I have the characters right, they have a tendency to tell their own stories. I will plot the book in thirds, because generally, by the time I finish the first third, the story will have changed entirely. SL: Who are your favorite authors? Which ones have influenced your writing? JGW: I love Dani Shapiro, Ann Patchett, Armistead Maupin, Jonathan Tropper. I’m not sure that authors as such have influenced my writing. I try to stay true to my own voice, because it is generally hard to remain consistent for an entire book in a voice that is not your own, or that is trying to be like someone else. SL: Have blogging and twitter affected your writing? Which blogs do you follow? SL: What is different in writing for an American vs. U.K. audience and how do you bridge the gap? JGW: I probably write more for an American audience these days, and I suspect my books are far more ‘touchy-feely’ than they would have been had I remained in England. We English tend to be a little more sarcastic and self-deprecating, and I have definitely lost that edginess living here eight years. When I go back and flick through Straight Talking, my first novel, I can hardly believe I wrote it. Of course the language is different too, as you, my friend, rightly pointed out: petrol instead of gas, etc etc. Mistakes that weren’t picked up for the first edition, but will be changed for the second! SL: What is your next project? JGW: The Practice Marriage has already started gestating. I am starting to make notes about my characters – three sisters, and I am excited. SL: If you could be anything other than an author, what would you be? 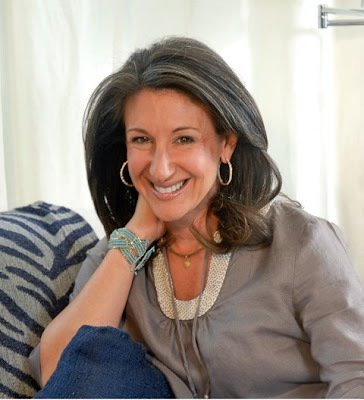 Blog Watch: Recent Jane Green Warburg interviews are at Laura Reviews, at All the Best and at bobvila.com. No other book reviews have been posted yet. If you review Dune Road/Girl Friday, come back and leave a comment with the URL. Be sure to visit other book review club posts from the link button below. Dune Road sounds like a magnificent read and thanks for the accompanying interview. May I add the cover is simple yet artistically arresting. It would jump out at me as I was browsing the store. Sounds like an excellent 'good read' book. Another great review, and another book to add to my must-read list. I managed to cross quite a few off the list during last week's miserable weather, so I guess there's room. Thanks! Great information regarding the book and the writer, and the process. You sold the package. I really want to read this book now! Now, and also NOW (in the sense of immediately). Blogging really can function as terrific word-of-mouth. I was unaware of Jane Green's work before I learned about her through your blog review of The Beach House. Your interview with her is a nice touch, but what neither of you mention is what an excellent blogger Jane is. Not all journalists are finding it easy to transition to blogging, but Jane is always interesting and entertaining. Dune Road sounds right up my alley. Oh, I actually didn't meant to make that pun! :) Anyway, great review and interview. I also poked around Jane's blog. It's wonderful. Thanks, Sarah. Great review and interview! Thanks for introducing me to the author ... haven't yet read any of her books ... but am looking forward to doing so! Hi Sarah, thanks so much for sharing you review and interview - it was extremely comprehensive and insightful. And, thank you for including the link to the Laura Reviews interview. I'd like to add you to my blog roll - you have amazing content! David, the cover is much improved by that splash of orange – it makes it ever so eye-catching. An earlier version had that stripe in pale green. Cover design is such an art. This book is as grabbing as its cover. Enjoy! Keri, I’d be curious to hear what you think of Dune Road. It’s lonely being the first to read a book but fun to share it. ME, last week’s rain was miserable but today is gorgeous. I want to read outside. Jane’s books tend to be sunny, making them good summer reads. Lakeviewer, it was fun to combine a review and an interview in one post, especially since this novel had so much on being an author. Bee, lucky you – it’s coming out first in England on June 11. Remember to ask for Girl Friday there. Thanks for adding the plug for Jane’s blog. Jane's blog is very engaging and personal - like yours too. Not all authors make good bloggers, but Jane took to it naturally. She’s a skilled writer on many fronts – impressive! Barrie, thanks for hosting another book review club. Dune Road is very you – a mystery, a working mom and an author. Kelly, I’ve reviewed 2 more novels by Jane Green (see the sidebar.) I’m sure you’d enjoy any of them. It is fun to meet new authors through blogging. Laura, welcome to my blog and thank you! I very much enjoyed your blog and interview too. Dune Road sounds great! I love realistic characters. Fab, fab, fab review and I loved the interview. I am very interested in the fact that she was/is also a journalist. That would definitely bring a different approach to her fiction-writing. From the speech, more direct, to the atmosphere, more reality-based, fewer flights of fancy. I can see that she has spent quite a long time in the US. She doesn't apologise for existng :-)! Serious, though, I've really had it with the whole self-deprecation in GB. It's probably the personality trait I like the least and the one I encounter the most amongst the hordes of Albion. The passages you quoted were very interesting. I particularly liked the one about the author having to churn out a novel a year, inspiration present or not. How true! Many thanks for another fantastic review. Beth, Jane is great at creating likable characters, some true to life and some larger than life. ACIL, thank you! Jane’s journalistic style makes her writing very easy to read. Her sentences are clear and her paragraphs are short. She doesn’t get bogged down in metaphors and long blocks of descriptive prose and yet still gives a fine sense of the scene. Jane livens up the narrative with good story telling and fun, imaginative characters. Like my expat husband, Jane is the best mix of American and English. I love how your book reviews are so very complete! And I love the idea of this book--the protagonist as a 'Girl Friday' for a great author. Wouldn't that be an interesting job? Awesome review. I love in the interview how Jane says she could be a chef, gardener, etc. Anything that involves creativity. I can so relate! But I especially respect the way you critiqued the book in your review. It's very honest and useful, though it's hard to publicly critique the work of someone you know! Alyssa, it would be a wonderful job for an aspiring novelist or a book lover. Maine author Lewis Robinson worked as an assistant to John Irving before he published his own books. They are all favorite authors of mine. Stacy, Jane is a very creative and warm person. Sarahlynn, knowing an author does not change my review other than give it a more personal angle; it does make me think twice about avoiding bias. My policy is to only review books I like and to do so critically looking at both strengths and weaknesses. I always reveal any personal connections. Jane’s and my relationship is more professional than personal, more like work friends or blog buddies. Jane’s response to my review shows that she has taken it just as I hoped she would. You are right that it isn't easy critiquing a friend's work publicly. What a great interview. It's really neat that you and Jane Green are friends. I'm going to put this book on my list! Donna, thanks! Jane and I aren’t close friends, more like work friends or blog buddies. We’ve only gotten together in person once since we "met" in cyberspace last August. I remember you saying that Jane Green was one of your favorite authors. I’ll be curious to hear what you think of her latest. This sounds like my kind of book. I love mysteries, particularly ones with well-developed and interesting characters. I especially like the accompanying interview, Sarah. Knowing what inspires an author and something about her purpose in writing always fascinates me. Thanks for this insightful review--marvelous "package" with the interview. I loved that you caught all the places where real life enlivened the writing--that's the wonder of friends doubling as reviewers. As a fellow Mainer, I enjoyed scrolling down to your previous post--our woods look just like yours right now! Rose, knowing an author and their motivations makes me appreciate a writer’s work all the more too. Thank you. Ellen, good point. I’ve spent time worrying about bias when reviewing work by author friends, but in many ways I think those posts are the most successful because I can bring another dimension to the review, a personal context. 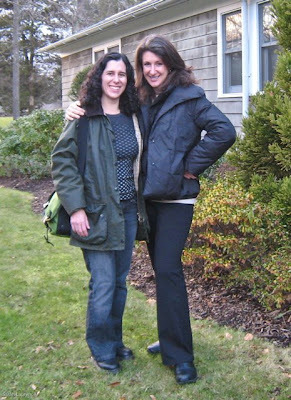 I didn’t realize until now that you are another Mainer – how funny that the two of us should cross paths on a Californian blog. Nice to connect with you! Your posts are so helpful to writers. I've often been told that the best books are based on real experience. Sounds like Jane used all of hers when writing her book. Lovely photo of the two of you too. Tina, Jane puts a lot of herself into her books, which give them emotional depth, but the characters and plots are fictional. Great interview Sarah and I will read Dune Road with great interest now.. hope you are enjoying the weekend, xv. Vicki, I’d love to hear what you think of it. Remember to ask for Girl Friday in England - it will be released on June 11 there. It’s a gorgeous weekend here in Maine. I’m off to walk the dog and then will read in my hammock. Good day for taking some more blog photos too. Enjoy your weekend too! 'Girl Friday' to an author, well that's an interesting theme. Do authors have to struggle a lot to keep parallels to their lives out of plots they're crafting, especially where they're trying not to bring it in? Anil, interesting question. All writers draw from experience, some more than others. When writing contemporary fiction, there is bound to be more overlap. I can only speak for myself as every writer is different. I made up the plot of S.A.D. based on my experience in school politics and a trial on intelligent design in another state. My novel is set in a real place with some changes, including the school district. 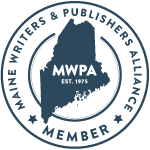 Since writing S.A.D., I’ve heard of incidents in Maine or read stories in the newspaper that appear to have come out of my novel. I created a fictional red-headed woman who is new to the school board and then a red headed friend of mine joined the school board a few months after I finished the first draft of S.A.D. On a smaller scale, I’ve borrowed dumb jokes from my husband for a fictional father character. I still make a point of NOT basing a character on a real person or using real plots. The fun of fiction is making up people and stories. As for Jane, I’d assume her plot was entirely fictional. At least I hope so! To have real events seemingly come out of your writing after you were done with it must be surreal to an extent. Just makes me wonder if it's indeed possible to 'see things' as in foresight when one is deeply involved with articulating a sense of place that one has come to identify with, strongly. Was curious to know if many writers rely on their own experiences more for the comfort they get from being able to flesh out characters they've experienced, and hence being 'true to their own knowledge' and 'characters they can relate to simply by having known them first-hand' and that it might otherwise be difficult to live someone out in the plot who's entirely 'alien' to the author? Anil, it was surreal to have life imitate art, but fun too. I had that alien issue when trying to create an evil character. I’ll call him a man for this example. My first attempt made him too creepy so he wasn’t believable. He needed some appeal and charm to attract victims. It’s hard to be sympathetic to a bad character and give him likable traits when you don’t condone his actions, but we are all a mix of good and bad. Character development stretches the imagination. Experience and research helps. I read many newspaper articles and books on topics even when writing fiction. I also talk to experts and test my manuscript on typical readers to see if I got the chemistry right. Characters aren’t fixed; they are more like lumps of clay. I wrote a post about the process of writing a novel (S.A.D.). Hi ~ I am out exploring in the blogosphere and landed here. I enjoyed the book review and interview of Jane Green. I am going to our local library tomorrow so I plan on checking 'Dune Road' out if it is on the shelf. So many books, so little time ;) Interesting blog ~ I'll be back. Take care. Deb, welcome to my blog. Dune Road will be released on June 16 in the US. The book sounds wonderful and I look forward to reading it. The interview was quite interesting. Thank you for this post!